During the period I developed and subsequently managed a portal for managers of care homes for the elderly, zorgbeheer.com, I posted an organigram (see below) that I had used at my own care home since around the year 2000. When the five principles above are respected, you create an environment where staff satisfaction levels are much higher than average. And this results in a much better service towards patients. If your staff is happy, so will your customers. 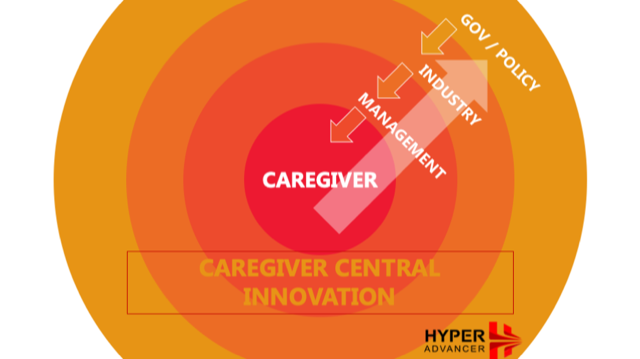 Management needs to convey they’re open for (change-) business, caregivers need to be aware tthat hey can change things, and then they have to be brave and determined to implement changes. That brings me to outer layers beyond the organisation, namely industry plus government and policy. They should also play a role model and lead the way. In a perfect world, they would listen carefully and try to facilitate change and improvement, inspired by the inner layers. And it’s our duty to keep pushing them. Bart Collet is the founder of Belgium-based Hyperadvancer and a consultant for HIMSS Liège. Healthcare IT News is a HIMSS Media publication. AHA: Wholesome Eating in Comfort Shops?